So the day after it was officially Spring, with that bucket load of snow that hit the ground in Maryland, my son, Harry and I, ventured to Terrapin Adventures for some high wire walking and rock climbing. I anticipated the cold with warm weather gear, but the remaining flurries on the ground did not deter us. We got a very friendly greeting at the base in Savage Mill, and our instructor Tim did everything necessary to allay Harry’s fears (and, er, mine) with some sage advice and instruction. These guys love their job and totally know that they’re doing, do you’re in ultra fun and super safe hands. You basically clip in and get climbing and walking on your high top outdoor adventure on the new Explorer Kids’ Course for 5-9-year olds. You literally defy gravity as you scale the different routes and heights of the specially made tower. 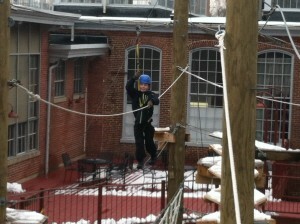 Harry’s initial trepidation turned into full-blown superhero action confidence as he weaved his way along wires. over rope walks, climbed nets and flew down ziplines. Harry declared the whole course to be like the most amazing tree house he had ever come across. He’s right , it is. And the Terrapin Rangers, who looked after us, were a great bunch of guys – all credit to them and their love of their job. Kayaking tours, wall climbing, geo-caching, bike tours, guided backpacking trips, caving, kayak fishing trips are also available – a brilliant way to explore the great outdoors! There were bachelor parties and kids parties lining up to take part – it’s a great day out for everyone and I cannot recommend this place enough. It’s a Spring Break must – book in advance! We’ll be back in the sunshine, and maybe this time I’ll smile when I go down the zipline!